Plumbing Fixtures - About Our Plumbing Fixtures And Services | Cupertino Plumbing, Inc.
Remodeling your bathroom or kitchen can completely transform the look, comfort, and functionality of your home. Whether you’re looking to perform a complete bathroom remodel from top to bottom or simply want to upgrade your existing plumbing fixtures, The Plumbing Bank showroom at Cupertino Plumbing is here to help. We invite you to stop by our public showroom for everything you need to get started on your plumbing remodel near San Jose, including a large selection of top-of-the-line plumbing fixtures, on-demand water heaters, and more. When you visit a public showroom, you have the opportunity to see and touch potential plumbing fixtures, toilets, and more. This gives you a chance to determine whether you truly like the look and feel of each option. Simply looking at pictures or shopping online cannot give you the same experience. 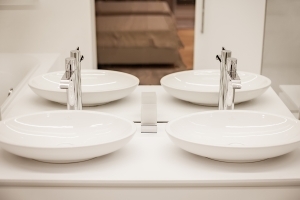 It can be difficult to determine which plumbing fixtures are best for you. Even if you have done your own research, nothing can replace discussing your needs with a professional plumber. Visiting a public showroom provides you with the opportunity to work with a professional to design and complete your plumbing remodel. Unless you know exactly what you want your new bathroom to look like, it can be hard to envision your new space and difficult to know how to get started. Visiting a plumbing showroom offers you physical examples of some of the most ideal bathroom layouts available to help you create a space you’ll love. Purchase the highest quality plumbing fixtures you can afford. Installing high-quality fixtures today means you’ll worry less about them breaking in the future. Consider the benefits of low-flow faucets, dual-flush toilets, and on-demand water heaters. These options can help you conserve water to save money on your utility bills without sacrificing comfort. Taking your time can be tempting to pick the first options that appeal to you, but taking your time during your plumbing remodel will ensure you create the perfect space that suits your home and your needs. Cupertino Plumbing’s public showroom, The Plumbing Bank, carries a wide variety of plumbing, kitchen, and bathroom fixture brands, including Delta, Toto, Rohl, Kohler, and more. Visit our showroom to view our products! Our plumbing experts can help you find the fixtures you want and need for your kitchen or bathroom remodel. Contact us today to learn more about our plumbing fixtures, we are excited to help you with your plumbing and fixture needs. Monday through Friday 7:30 a.m. to 5:00 p.m.